This entry was posted in aerial recession in landscape paintings, atmosphere, David Bellamy, leaving out detail, Negative painting, Painting courses, Painting misty scenes and tagged #paintersonline, #saunderswaterford, #stcuthbertsmill by David Bellamy. Bookmark the permalink. How I envy this wonderful course. However I am purchasing the book, which will be gratefully received. 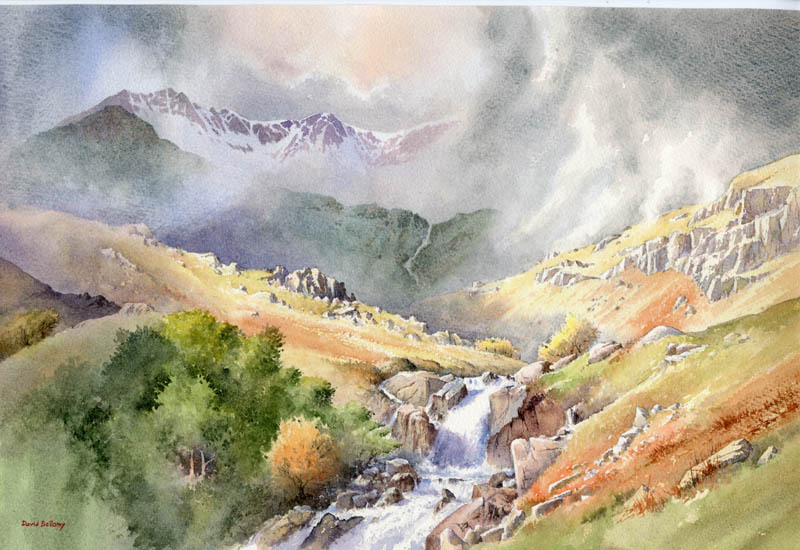 I do still paint at home, not a good year healthwise, not able to drive anymore either,so just enjoying my artwork at home, with very happy memories of visits to Wales and your courses. .your books are a great source of inspiration. With Best of Wishes to you and your Wife. Sincerely,Diana Crosser. You all seem to have had a great time and taken the rough with the smooth. Even our parts of the country have diminished water reserves: the Elan Valley and our local stretch of the Wye are getting really low. But the silver lining is that some handsome looking rocks are uncovered, which also make good painting subjects. Happy painting summer and see you in Partchings!